Welcome back to Part 10 of The Accidental Remodel! Before I started with any of the wallpaper, I watched a lot of YouTube tuts and talked to people at Lowe's and Home Depot. NOTHING worked! The first nightmare was the over five hours working to get just the 13"x30" spot behind the stove off and utterly destroying the wall in the process. That was using DIF. Of all the things we tried, the one that worked best was apparently dangerous too. The cabinet man told us his wive uses 50/50 ammonia and water. We had all the windows open and the ceiling fan on. We were doing the rest of the back splash, which now makes us want to cry. I'll explain later. It still only came off in the tiniest pieces and still tore up the wall, but was a little better than DIF. When we finally are done, I'm feeling so badly that I start googling amonia in the middle of the night and find out just what serious stuff it is. The smell was STUCK in my head! The room didn't smell any more, but that's all I could smell. I actually called the poison line to ask if I was ok. I was surprised to hear later that DH had the same thing. We both smelled it for almost a full week! You can see we replaced the stove vent with a shiny new black one! What a difference it made! And just a word about remodeling - there are so many organizations that can put what we remove to goo use. I gave this to a Veteran's associations and my sink/faucet to Habitat For Humanity (who picked it up from my porch - over 100 lbs.!). I mean really, why would anyone want to dump more into our landfills when there are those who could actually benefit from it? 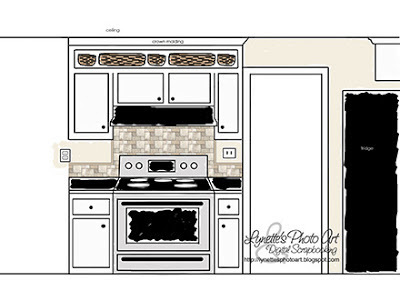 I still couldn't decide what to do with the backsplash. We were getting a granite countertop, but not a granite splash as they'd done it so wrong on my daughter's counter after the tornado, that her new faucet has to sit at an angle! It's always upset me, (which becomes funny later in the remodel which is soooo full of irony!). So I didn't want a granite backsplash. Tile is expensive and I hadn't done it before and was concerned if I could do a good job. 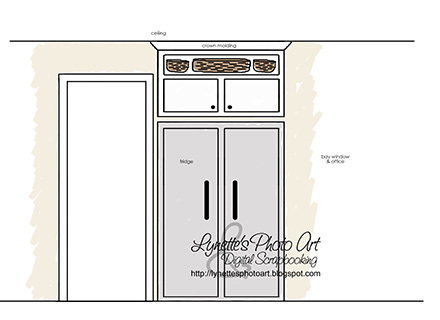 I was quoted $1,400 in labor alone for my existing counter, not even the little counter that will come after the cabinets are in. Wow! I combed the net for ideas. But in the end, the only other thing I knew to do was what I had done in both bathrooms. (Pictures are in my label cloud under "Money Saving Tips"). I had "painted" the walls with drywall mud and then painted several coats over it. It's held up perfectly in both bathrooms for many years and we don't have any exhaust fans. But I really didn't want that for the kitchen and I wasn't sure if it would hold up to that much water, even if I used several coats of hi-gloss. 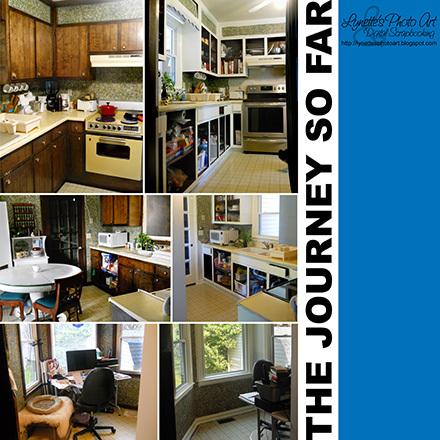 In the end, with neither of us being able to decide what to do, to keep the project moving forward in hopes of someday being able to use the kitchen again, I did what I knew how to do. I mudded it with texture. So here's part of the "sad" I mentioned above. 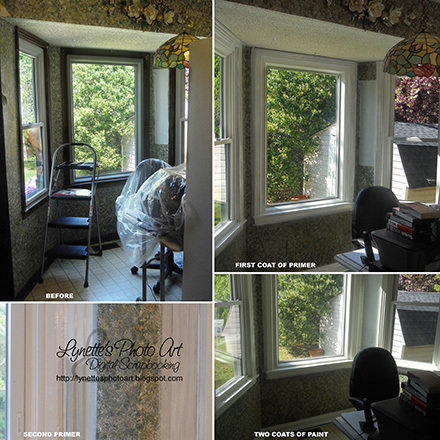 Since the wallpaper was on sooooo tightly, I wouldn't have had to remove the wallpaper to do this treatment. But it gets even sadder in that my husband ultimately decided he wanted "some tile," and we didn't have to remove the paper for that either...but now we had to sand it smooth after I'd done all that texture in the mud! Ahhhhh! LOL Don't you love remodels? God bless the man - he did this sanding for me! I can't even reach in the corner. I have to use a stool and then kinda crawl on the stove/counter to even touch the corner. Yep, tiling was FUN! LOL! So the long and the short of it is that we ended up trying so many ways to get the paper off all the walls, FAIL! And tried sanding down the wallpaper seams and giving it several coats of primer, FAIL! So in the end, I had to sand transitions where I'd removed paper and skim coat over the paper and the places where paper was gone - almost the whole room and sand and patch and sand and patch and sand ad-nausium! Mommmy!!!! I have come to the conclusion that WALLPAPER SHOULD BE ILLEGAL!!! And all this with my poor surgical hands and arthritis! I'm going to pout for a while now just remembering all this! Welcome back to Part 9 of The Accidental Remodel! Thanks so much for joining me on this adventure! Today is the second coat of paint on the cabinets! Isn't it looking so much better? See little Boo peeking around the door? What do you think? I can't wait for the old dish washer hole to have it's new drawer and two doors - finally after fifteen years! Once I put all the doors back on, within minutes there were chips in the paint, down to the dark brown! Four layers! I was devastated. I did everything possible to make sure the paint adhered and would last for years, then only minutes later it was coming off. I'd even used the most expensive super amazing primer that sticks to ANYTHING. 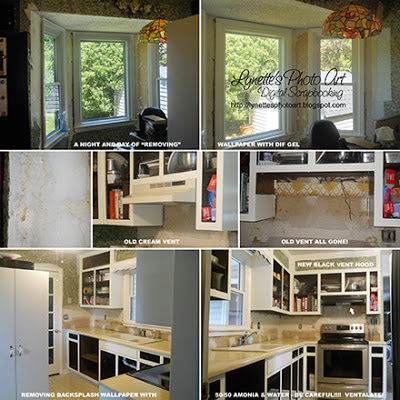 When we did my youngest daughter's kitchen in January, it covered dark brown paneling and EVERYTHING she had, no problem, and it's still fine almost six months later. So, was really discouraged. But now, many weeks later, nothing new has come off since that first round of chips...except what the granite men destroyed. So now things are looking more hopeful. My oldest daughter said she had the same experience where they had painted this same off white over dark brown. I hadn't known. She said she just kept patching till it didn't come off any more and is fine now. I have chosen not to do final touch ups until the cabinet man finishes his work...(praying he actually comes and does what we paid him for months ago...and that he does a good job). UPDATE: I'm well past this point now and I have figured something out about the paint problem. In carefully re-reading the paint can, I now see that though it's dry to the touch in an hour and you can re-coat in two hours, it states that "maximum strength is reached at seven days". Light bulb! That would explain the fact that after a few days, no further damage has shown up! I'm now working on a desk make-over for my office in the bay window and this time I'm trying to wait the seven days before I put all my equipment on it. We'll see if it stops the damage! And yes, that project will be in a future installment of The Accidental Remodel. 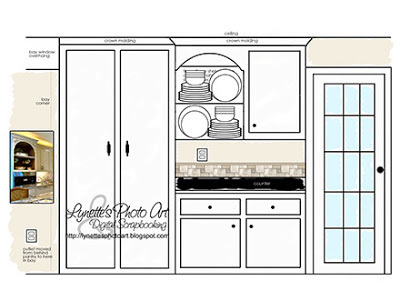 And here's a spoiler - you won't believe how the kitchen looks at this point! It still has a long way to go, mostly due to the cabinet man still not doing his part, but you are going to be amazed at the change in this room! I'm SO GLAD you are going on this journey with me! So, all is well and we are a step closer to being able to return to normal life! See you for the next installment! Welcome back to Part 8 of The Accidental Remodel! Next I tackled the trim in the bay. You can see where I experimented with primer on the wallpaper, since I'd had such a nightmare removing just the part behind the stove. Primer not so good, but it's already brightening the area. Two coats of paint ... oh so pretty! One thing I figured out when I was repainting all the woodwork in the the living and dining rooms was a happy solution to a problem I've had ever since getting replacement windows. They installed them wrong in so many ways, but one was the clear caulk on the inside. It collects dust and dirt and is impossible to clean. It looks worse every year. Well, after painting around the first window in the other rooms, it hit me to wonder if paint would stick to the plastic replacement window? I painted over just the surface that had the caulk and IT WORKED! So, since then I have painted the outermost plastic surface with my woodwork and all the ugly caulk is GONE, praise God!!!!! See ya for the next installment! Welcome back to Part 7 of The Accidental Remodel! Next I learned to HATE blue painter's tape! I spent sooooo long perfectly taping all FIFTEEN little windowpanes in our door and the floor where the cabinets would be painted. Had to be perfect! Was soooo careful to press the edges down tightly over and over like the compulsive overachiever I am. But all to no avail. Look at the horrid job it did. I might as well have not taped at all and just used a razor blade....which by the way, I ended up doing so much of that I couldn't feel two fingers for days and days! Then my daughter insisted I buy one of those razor blade holders ... a bit closing the barn door after the horse is out, but wow what a blessing! I still haven't finished cleaning up all those edges. So upsetting! She has cleaned some of the panes up for me. I chose to just move on to the next job, knowing this will surely still be waiting for me when I'm done with the rest and can use the kitchen normally again. :( It ruined my floor too. I had carefully taped, but now there's paint all over the linoleum and I don't know how to get it off. Me HATES blue tape! Long live the Frog! Welcome back to Part 6 of The Accidental Remodel! Last night I hammered out the panel at the top left. I had hoped to make it into a shelf (closing off the top of the cabinets) so I could use baskets up there. Sadly the panel is too deep to just lay down in the opening so I can add furring strips to support it, and too long to fit out the hole so we can trim and re-insert it. We don't have any tool that will help get it out. Guess we will have to let the cabinet guy earn his money to do it, if he ever comes! I also bashed the snot out of the one over the sink and could only get the top loose and the entire valence was moving. DH tried (hence the hole from a mighty blow) and then he saw it was actually inserted behind the face frame against the shelf that the light is hung from. It's so not coming out without the special tools. I give. I'm toying with the idea of storing Christmas decorations in the baskets as they are only needed once a year and are light weight. That could make our closet much more livable. We had moved Christmas to the closets long ago as getting in the attic isn't too friendly for either of us any more either. Now that we finally bought a step ladder (so I could do this job), it would be possible to reach them. All these years of stepping on a chair from the floor to reach things has been increasingly heinous on my body. Step ladder = GOOD! Welcome back for Part 5 of The Accidental Remodel! With the cabinet doors all finished, it was time to start inside. 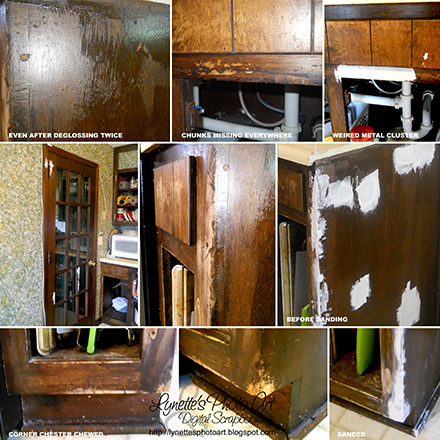 I used the same 26 steps I listed in Part 4, along with LOTS of patching and sanding. That impressive corner was courtesy of a puppy we had. I told you that the "before" pictures didn't show how ugly the wood was, but now you can see! Here's how it looked after the first coat of primer - ahhhhhh! I'm choosing not to freak...yet... because the first primer, even the second on the doors looked bad too. In fact, it wasn't until the 3rd coat of paint I felt better. LOL and I had thought I'd get two coats of primer on today!!! LOL! Then there's moving the fridge and doing the cabs above it, walls behind and the entire bay area and studio door...patience. One step at a time. I see now that the existing stove vent is going to look horrid when the paint is done. Needs to be stainless I think because of the stove and the sink that will come with the counter. Thanks for joining us on this adventure! Welcome back for Part 4 of The Accidental Remodel! 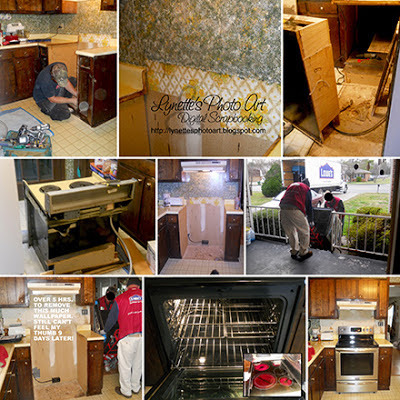 We didn't plan it, but once the new stove was in, the ugly cabinets became uglier...well, to my husband. They were always ugly to me. I was grateful to have them, but they were ugly and STICKY when we got the house and nothing I tried improved it. I always felt like they were dirty. The pictures make it look much better than in RL. So, since replacing is horrifically expensive, that = painting. 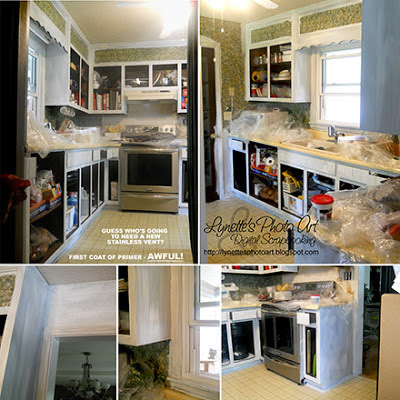 When my oldest daughter's house was rebuilt after the tornado, they painted her kitchen cabinets. It's been awful ever since. Everything sticks to the shelves and you have to "break" them off to remove them. It's NOT good. And the doors stick and pull paint off when opened. So, I didn't want to paint the insides of the cabinets. The doors were ugly, but the shelves are ooooh so nice! 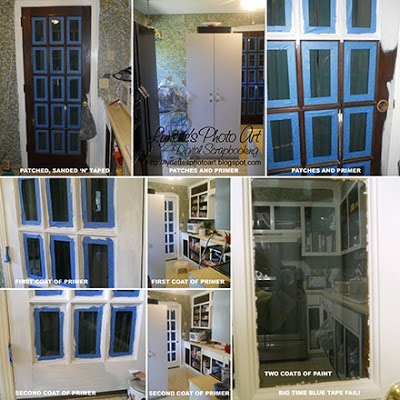 I have recently been seeing accent cabinet make-overs on line that are one color inside and a different color outside. I have really liked it. 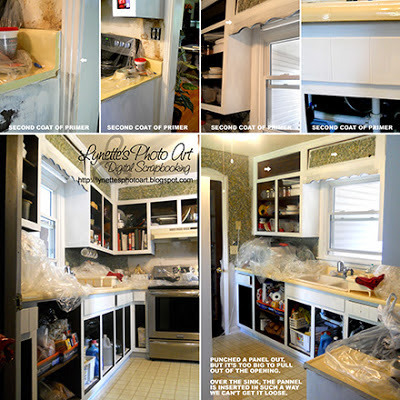 So, I decided not to paint inside my cabinets, even though I was going to paint the outsides, windows, doors and trim the same soft white Mascarpone that I'd painted the trim in the rest of our space. It saved money for deglosser, primer and paint, tons of work and time, all with the bonus of no possibility of messing up my shelves! Yeah! Knowing that the cabinets were sticky to start with, I figured paint wouldn't want to stick. I wanted to do it right so this would last. I researched and asked experts and ended up with 26 steps for every single inch! I quickly found out that the breeze was speckling my work with blossoms, leaves and tiny insects. I had to sand the nature off between each coat! For the final coat I carried them inside immediately, then went to paint the next door. 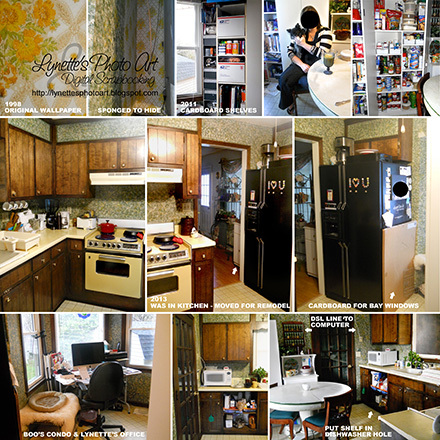 In the bottom right picture you can see how I had to move all the kitchen things into the rest of the house. I left only the pantry, now moved to the middle of the kitchen floor. You like my pretty yard? :) I hope you will come back for the next step in our adventure! While the man was here to cut the cabinets down to fit the new stove, I asked him to estimate knocking out the panels at the ceiling and making them into shelves. I plan to put baskets in them ... and maybe store Christmas in them ... all sorted! An organizer's (me) dream! And I asked for an estimate to put cabinets and counter on the empty wall that I had filled with homemade storage...even cardboard boxes to store Bible Class supplies in. 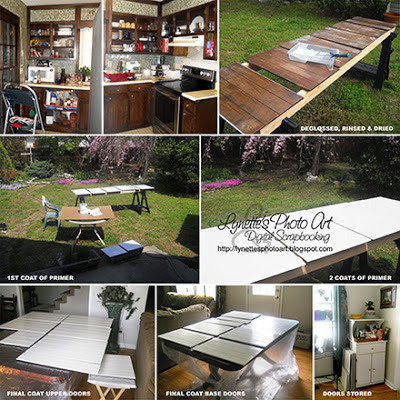 You can read about that project too under "Money Saving Tips" in the label cloud. His price was better than the bottom of the line ready made, finish yourself ones at Lowe's. He required a huge deposit to "hold our place" in their order of jobs. He said it would be sometime in July. That's like 5 months. As an aside, he's not returning our calls and any prayers you care to give on our behalf would be GREATLY appreciated! So, I started designing the room in PhotoShop, doing mock ups so we could see how things would look. 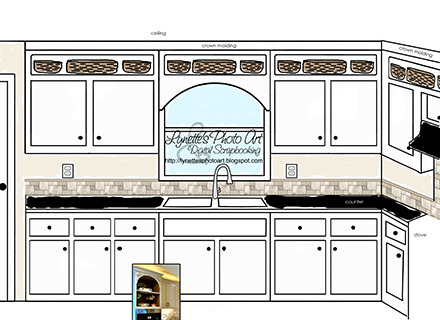 After tons of options for our little kitchen, we settled on a design. This first one is the wall of new cabinets. Though it will be a very tiny cabinet, I wanted one open to show my pretty plates and add some style. See the pretty new faucet below that my daughter gave us? The inset picture was to give the cabinet man the idea of what kind of arch I wanted. I hope you stop by next time to follow the story! Welcome back for Part 2 of The Accidental Remodel! For this to make sense, you need to read the last post, so scroll back one for Part 1. This was the "before" I compiled from very old pictures. It didn't look that good now. My husband decided it was time for a new stove, just decided it one night! It's an older home and the stove has never been right in the fifteen years we have owned the house. But it's a drop in unit and to replace it with a normal stove would require hiring someone to cut down the cabinets to make room. The expense had always stopped us. But, we got a stove from Lowe's and paid a man to do the cabinet work. Just FYI, if you sign up for the Lowe's credit card, you get 5% off everything you charge on it. If the purchase is $299 or over, you can choose the 5% or 6 mo. no interest. Needless to say, even though it's only a drop in the bucket, we have bought EVERYTHING for the remodel at Lowe's. Disclaimer: I have no connection to Lowe's and am not receiving anything in return for my postings. I killed myself for over five hours one night getting the wallpaper off from behind the stove. I couldn't feel my thumb for weeks! I tried several ways to get it off. Nothing worked and it really tore up the wall. I wasn't prepared for this change. You just never imagine the crazy problems that change will bring. You think, "Wow, I'm getting the first new stove of my life and that will be nice. It's so clean and pretty!" Not so much. The normal stove stuck out from the wall so far that I no longer can open two of my drawers and the narrow cabinet left of the stove. Weeks later my husband figured out that if I open the oven door, I can pull one of the drawers out, but the other drawer and cabinet are useless now. The delivery men had to come back and try again as they had left it 3" from the wall. It's a little better now, but not much. It sticks out so far, I keep tripping on the drawer under it! With it's legs all the way up, the stove was barely even with the counter. Strange. When I tried to use the oven, I found that the door is so large, almost all my body is IN THE HOT OVEN when I'm trying to put something in, test it or take it out - not cool! It's really unlikely that I could do a heavy turkey so far away from my body. Since this deluxe model was only $150 more than the kind I used to have (stripped basic with coils on top), we had gotten this one. It has a cooktop, is self-cleaning and has convection cooking. Of course, I read the manual first as all this is new and alien to me. I didn't get far before I was so overwhelmed I was fighting tears and wanting to send it back. Every single food has certain rack (of three racks) you are to use on a certain of seven levels. They listed ALL materials cookware is made of and said every one of them caused some damage to the cooktop surface. What are you to cook with? You were to turn it off before things were done cooking as it would stay hot...how early? And yes, it stays noticeably HOT for MANY HOURS after it's off. That should be fun in the summer here in the Deep South. It just went on and on. I finally talked to my sister-in-law who is a home ec major, has taught it in school and has had a cooktop for decades. She basically told me to put the manual away and pretend it was a normal stove! LOL Took a long time to even try it. Half afraid to touch it! Due to The Accidental Remodel I haven't had time to use it much and the kitchen is all torn up, so it's hard to cook. Sadly, of the few times I've tried the oven, nothing is turning out. I hope in time I will learn how to use it. Right now it's a $1,400 decoration that I have to clean constantly! 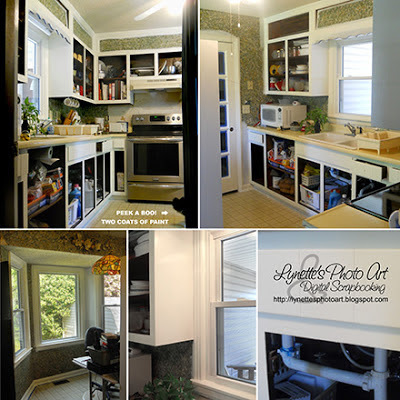 (Price includes the cabinet work). I had thought that a cooktop would be great as I could keep it clean! Not so. It's being so much work. Everything I sit on it leaves a mark to scrub and I do mean SCRUB. My normal dish towel doesn't pick water up from it. I had to get microfiber, and not just any microfiber. The first two I tried still didn't pick the water up. I ended up with a bag of brilliant yellow ones from Sam's that are picking up the water from the cooktop and the new granite (which towels weren't picking up from either). It's a pretty yellow, but I want a deep red as accent in the room and the towel is always in view to dry. I had to buy special cleaner. More expense. Every speck shows up on the lovely black surface. A thought started forming in my mind at that time that having old junk was much easier and cheaper to care for, carefree! That thought has been born out with every step of this process. In my altered mental state trying to adjust to the changes in my alien kitchen, I ponder if it's all a cosmic joke that we think these things will be good things in our lives and the joke's on us? LOL! Come back for the next installment! I know this isn't a new song, but it's still a great (and beautiful) one with a very good message. Hope you enjoy By Your Side by Tenth Avenue North!